The European Union is governed by a series of astonishingly strict fiscal rules. According to its Stability and Growth Pact, member states cannot run deficits that extend beyond 3 percent of GDP or maintain levels of public debt that exceed 60 percent of GDP. Since 2013 , member states are also required to pursue balanced budgets. These restrictions make little economic sense , especially since there are no pan-European debt-sharing measures and the European Union can't issue bonds of its own. The world’s most powerful economies, moreover, would all be in violation of at least one of these rules: China ran a budget deficit  worth 4 percent of GDP in 2017, the year with the most recent available data; Japan has held a debt-to-GDP ratio of over 200 percent  since the financial crisis; and the United States currently boasts a deficit-to-GDP ratio of 3.9 percent  and a debt-to-GDP ratio of 104 percent , with the country’s Republican president not even pretending to care about balanced budgets. On top of these constraints, each member state’s budget needs approval from the European Commission, the European Union’s executive branch. The institution is made up of appointees from the governments of member states—a fact that gives it some democratic legitimacy, but not nearly enough given its immense authority. To put it in U.S. terms: imagine a newly elected state legislature in Michigan determined to tackle poverty, but first having to run its entire budget by a Congressionally-appointed committee in Washington, D.C., only to be told that it needs to scrap its plan and instead focus on trimming spending. That’s roughly what happened to Italy’s new populist government last year. After Rome presented an original budget in defiance of the European Union’s deficit and debt rules, the Commission threatened the Italian government  with what’s known as an “excessive deficit procedure,” a set of hawkish fiscal policies to be carried out under its close surveillance. The costs of noncompliance can be prohibitively high. If it had been ignored, the European Union could ultimately have leveled a fine worth up to 0.5 percent of Italy’s GDP, a whopping €9 billion. Facing these risks and mounting anxiety from investors, Italy eventually conceded and settled for another budget that involved less spending. It doesn’t take a flag-waving Lega voter to see the problem here: there’s basically nothing the people affected by these arbitrary economic rules can do about them. At the same time, the European Union has implemented a series of regulations (laws that are immediately applicable across member states) and directives (general principles that must be enacted through national laws) that have together chipped away at public oversight of the economy. Over the past few decades, the European Union has approved directives that require the liberalization  of gas and electricity markets, telecom markets , and the postal service . It’s also put into place a series of regulations and directives  that force countries to open up their public rail systems to private-sector competition. 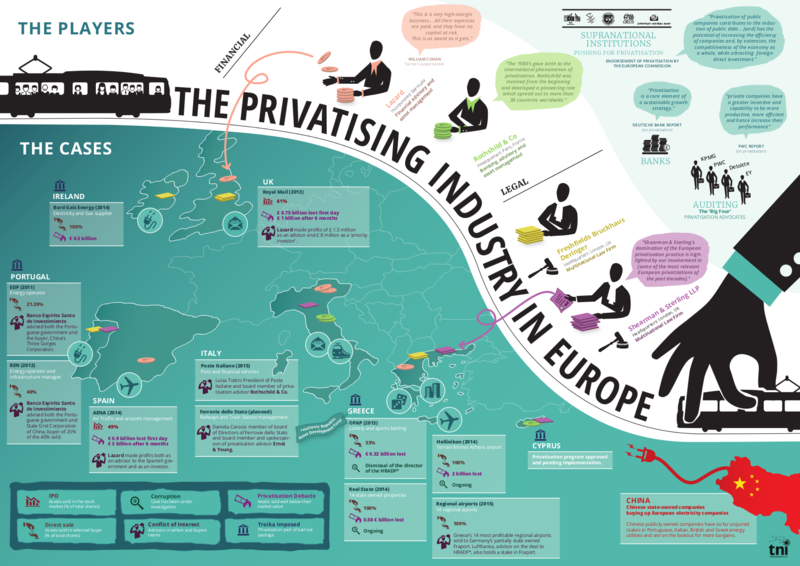 This comes in addition to the ruthless waves of privatization the European Union required of countries seeking bailouts after the financial crisis of 2008: Ireland was forced to privatize  its electricity and gas supplier, Portugal was forced to privatize its energy operator, and Greece was forced to sell off its regional airports. Ideally, a pan-European working-class identity would take shape to counter this onslaught from capital. In fact, it already exists to some extent, especially in strongly unionized sectors. Ask a mail delivery carrier in Normandy, for instance, whether he feels like his interests are closer to those of his boss in Paris or those of a colleague in Eindhoven; the answer he’d give should be obvious. Many European labor unions, too, are already running transnational organizing drives—like those at Ryanair  and Amazon —and recognize that these sorts of initiatives are critical to their long-term viability. Some left-wing political parties are also improving links to one another. While Europe’s old alliance of social-democratic parties has largely abandoned its dreams of social change, newer parties like La France Insoumise and Podemos in Spain have filled the void and sought to strengthen ties across borders. This strategy is a deeply cynical way of dealing with criticism. But it also risks further legitimizing the nationalist camp, something French Socialists experienced in the early 1980s. Still in the early days of his presidency, François Mitterrand was worried about mounting opposition from the mainstream Gaullist right. In response, he instructed the state broadcaster to give more air time to Jean-Marie Le Pen, the founder of the then-young National Front (FN), a fringe party fueled by colonialist nostalgia and social conservatism. Mitterrand also moved to hold legislative elections  under a system of proportional representation instead of the two-round scheme typically used in the Fifth Republic, thereby ensuring that the FN would peel off support from the mainstream right. These moves might have satisfied Mitterrand’s most immediate goal, but they weren’t wise in the long run. The FN went on to win over thirty seats in the National Assembly in 1986, giving it an indispensable platform from which to spout its toxic views. Sixteen years later, in 2002, Jean-Marie Le Pen shocked the French political world by winning nearly 5 million votes and qualifying for the runoff round of the presidential election. In 2017, his daughter Marine earned more than 10 million votes in the second round. Where does this leave everyone else—those of us who believe in a European Union that allows states to tax, spend, and regulate on behalf of the working class and one that authorizes national governments to implement the platforms citizens elected them on? Is there any hope for reviving European social democracy? Or even, as the socialists Ralph Miliband and Marcel Liebman once asked , going “beyond” it? In the March issue of Le Monde diplomatique, French philosopher, sociologist, and economist Frédéric Lordon said that it’s time for left-wingers to cast their European pipe dreams aside. He argues not only that the European Union is an obstacle to any ambitious, progressive political agenda, but that it cannot possibly be reformed in any meaningful sense. Changes to treaties require the unanimous approval of member-states, and Berlin is all but certain to block any effort to change the existing order. Boasting record budget surpluses  and a powerful export-oriented manufacturing sector, Germany is served quite well by the existing budgetary rules and monetary policies. Lordon may ultimately be right. Even so, it seems hard to know for certain without putting up a fight.